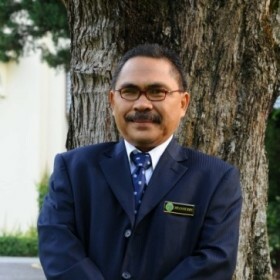 Dr. Shamsuddin Ibrahim studied Forestry at the Mara Institute of Technology and obtained his Bachelor degree in Forestry from the Agriculture University, Malaysia. He later went on to pursue a Masters degree in Tropical Ecology from the James Cook University, Townsville, Australia before obtaining his PhD from the University of Wales, UK. Starting off as a planning officer in the Forestry Department of Malaysia, he was later promoted to Forest Plantation Manager. In 1982 he became the Deputy Director, State Forestry Johor in charge of supervising and controlling forestry operation, including manpower planning and training and infrastructure developments in the state. In 1985, Dr Shamsuddin joined the Forest Research Institute Malaysia (FRIM) as a Senior Scientist. He conducted research in peat swamp forest with emphasis on ecosystem productivity, natural distribution patterns of important tree species and the impact of the current logging practices using hydraulic excavator and canal to forest vegetation in peat swamp forest. Dr Shamsuddin was appointed as a National Project Director in early 2007, to supervise the implementation of external projects funded by International Tropical Timber Organisation (ITTO) and Global Environment Facility (GEF). Currently he is managing R&D within the Division of Forestry & Environment at FRIM. The main R&D focuses on improving the supply of timber within the country through intensive management of and natural forest with emphasis given to improved production of planting stock, improved planting techniques in degraded logged-over forest, post-planting treatments and control of pest and diseases. Besides managing R&D in dryland forest, a substantial amount of time is also devoted to managing a national project on coastal rehabilitation for protection purposes. He is an active member of the International Peat Society Institute of Foresters Malaysia (IRIM) and Malaysian Ecological Society.